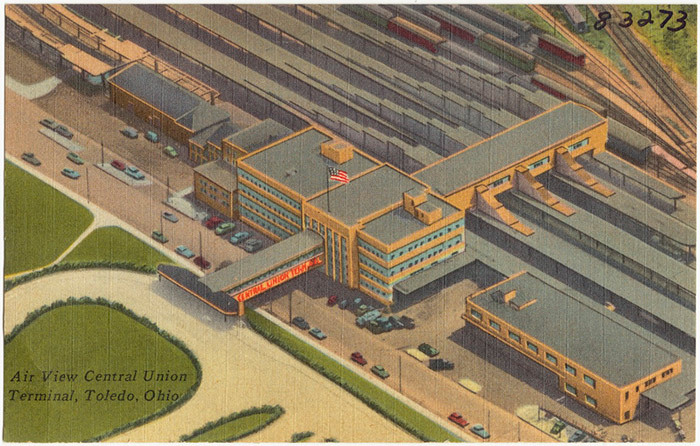 The opening of Toledo’s new Union Station, Central Union Terminal, in September 1950 was a big, big deal to Toledo. After all, who devotes an entire week to celebrating the opening of a train station? 1950 Toledo, that’s who. In this post about Toledo’s old Union Station, I recounted the feelings Toledo held towards its old Union Station, a mix of shame, despair and desperation (at being unable to get a new one). It was decrepit, and even a 1930 fire failed to bring about a new station, the New York Central railroad choosing to rebuild instead. 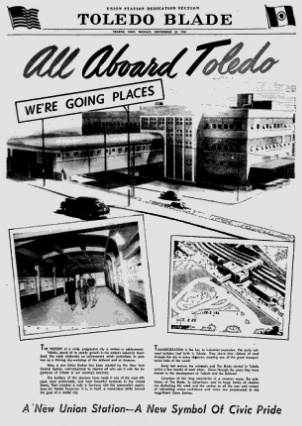 World War II held up the progress even further, and it was not until 1945, on the day after the closing of the Toledo Tomorrow exhibit, that the NYC informed the city of its plans to build a new station. Feelings ran deep. “The inferiority complex which the antiquated station gave this city manifested itself insidiously in various forms. 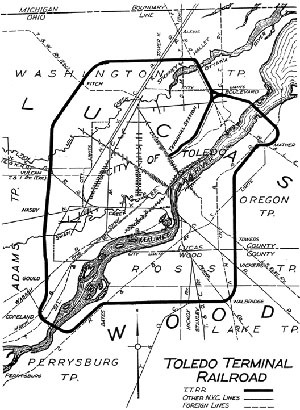 It created the impression that the citizens of Toledo must be awfully stodgy people and generally set in their ways. It contributed to the feeling that Toledo lacked the initiative and the vision to put big civic projects over like other cities,” the Blade wrote in an editorial. 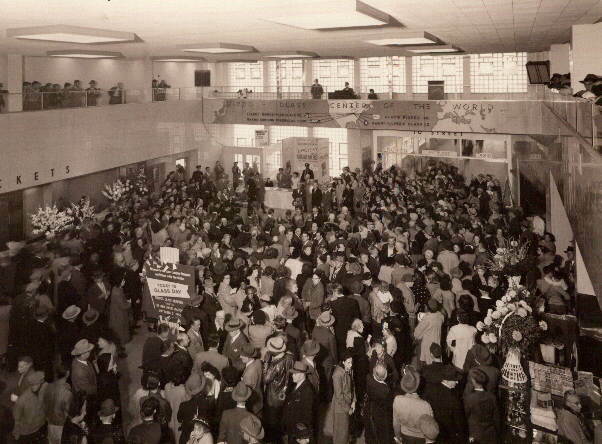 The new station cost $5.6 million and took three years to build, and NYC officials were on hand for the groundbreaking (or spike pulling, as they called it) on October 2, 1947. The latest features and most modern amenities were promised, as well as the use of lots of glass, befitting Toledo’s nickname as the Glass Capital of the World. The station would serve the NYC, the Baltimore & Ohio, the Chesapeake & Ohio, and the Wabash railroads. The front of The Blade’s special section commemorating the opening of Toledo’s Central Union Terminal, Sept. 18, 1950 (click to see the section). At the start of the week, The Blade ran a 28-page section commemorating the event, and reading it is like browsing a history of transportation in Toledo as well as looking at a glossary of Toledo businesses: ones you’ve heard of, like Owens-Illinois, Columbia Gas, Toledo Edison, Libbey-Owens-Ford, Willys-Overland, DeVilbiss, Auto-Lite, Champion, Toledo Scale and some you haven’t, like the Wine Railway Appliance Co. So The Blade was all over this. The festivities started on Sunday September 17th, with the closing of the old station and the first train at the new station (a college student bought the first ticket; he was headed to Cleveland). There were juggling, acrobatic and dog acts, concerts and an open house. The entertainment and open house activities continued all week. 70,000 people came out to see the new station on its first day. 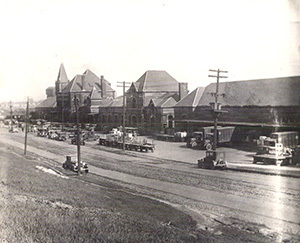 Once the new station opened, the old Union Station was quickly demolished. On Monday the 18th, a new billboard based on the one put up by Kenton Keilholtz (“Don’t Judge Toledo by its Union Station”) was unveiled: “Now! Judge Toledo by its Union Station.” Keilholtz, who had moved to California, came into town to attend the unveiling. Tuesday the 19th was Young Toledo Day. Schools closed at 2 p.m. and kids crowded the new terminal. Wednesday the 20th, Ted Mack (of Amateur Hour fame) arrived, and an afternoon tea hosted by the wives of city council members was held. Thursday the 21st was “Glass Day,” which involved the unveiling of a sand-blasted glass mural inside the terminal. Friday the 22nd was Dedication Day, which was marked by the arrival of the longest coal train in the world. The 206-car train was more than symbolic, because along with the new station, the NYC had made a large investment in the loading docks at Presque Isle. 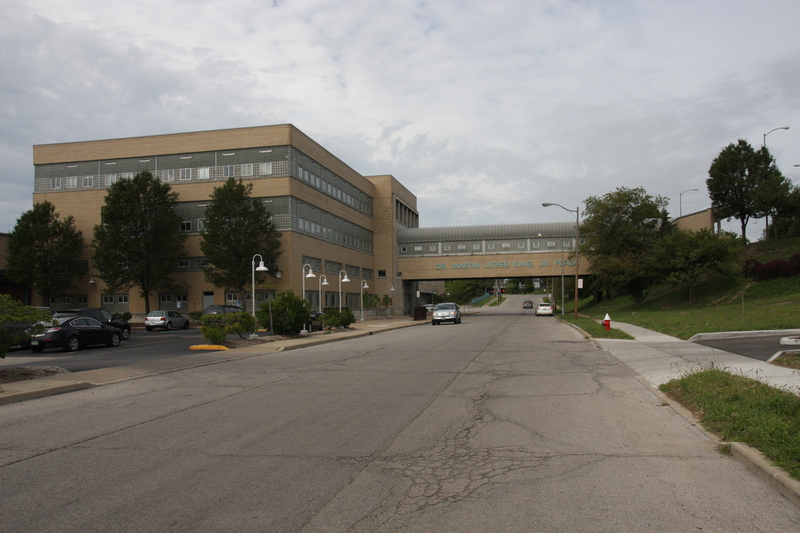 It was all part of a $15 million investment the NYC had made in Toledo-area facilities (it had 4,000 employees on the payroll in the Toledo area). 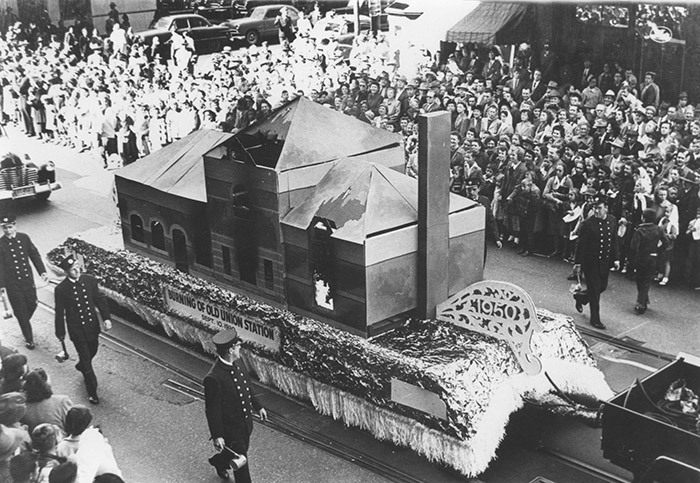 And on Saturday the 23rd, to wrap it all up, there was a gigantic parade through downtown: 31 bands, floats galore, 2-1/2 hours, two miles long. Somewhere between 150,000 to 200,000 people lined the route from 20th and Jefferson, down Summit to Broadway and to the station. But passenger rail began to fade at almost the same time the stationed opened. The Interstate Highway System would be built, making intercity travel easy. Air travel became safer and faster. By 1967, the NYC’s flagship train, the 20th Century Limited, passed through Toledo for the last time. For a time in the 1970s no passenger trains served Toledo. Today in 2017 it is only four, all Amtrak: the Lake Shore Limited and the Capitol Limited, both twice daily. The station was one of the last union stations constructed in the United States, according to the Toledo-Lucas County Port Authority, who acquired the station in 1994 and spent $11 million to renovate it. It was renamed Martin Luther King, Jr. Plaza in 2001. In celebrating the completion of their Union Station, therefore, the people of Toledo are aware that such an event means much more to them than it could possibly mean to people anywhere else. Just as the old station was the symbol of what they didn’t want Toledo to be, so is the new station the symbol of what can be done to dress up, to improve, to build the greater Toledo they all want. Martin Luther King Jr. Plaza in 2004. Photo by the author. 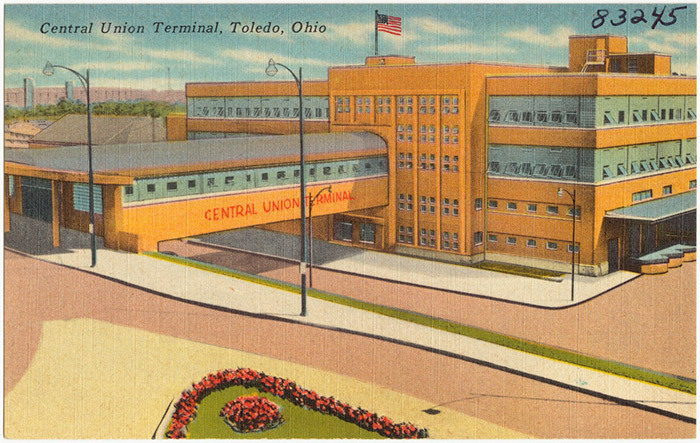 A postcard of Toledo’s new Central Union Terminal. From the Boston Public Library, digitalcommonwealth.org. 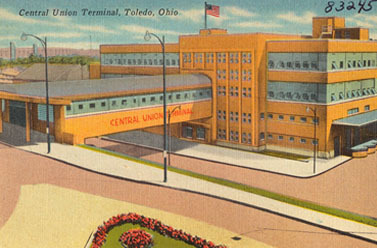 A postcard of Toledo’s new Central Union Terminal. From the Boston Public Library, digitalcommonwealth.org. Yeah, I like old postcards. Next PostIt’s 1980. Let’s eat out! building quite cool and comfortable in the summer. later. a lady even reopened the snack bar — so i could have lunch if i wanted. i guess what i am trying to convey is: even though central union terminal was a time-capsule even then, and even though it was much too big for the single train it served, it still functioned beautifully. with nice dining cars and really superb crews). i looked forward to my visits to central union terminal and remember many happy times there!